Asda showcases its range of Halloween-related products in a new advert, titled “Home For All Things Haunted”. 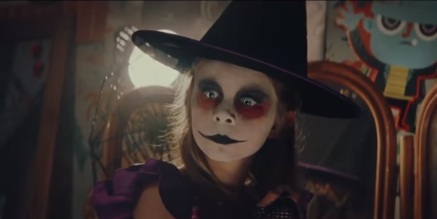 The 30-second spot begins with a group of young girls getting ready for Halloween. After a thunder strikes their house and radio, one of them start singing the 1986 hit song “Word Up!” by American funk band Cameo. The trio are going down the stairs, where their parents are also wearing Halloween costumes. As they all become possessed by the Halloween spirit and the music, they begin dancing along. Soon, several other kids and adults, all dressed in Halloween costumes, show up and dance along, as well, while the girl keeps singing. Asda offers kids fancy dress costumes, from ghostly Grim Reaper costume to Skeletons wearing tutus, adults fancy dress costumes, from spooky ghost to Ghostbusters, party food, including chilled & frozen party food, snacks & treats, Halloween bakery, like Mr Kipling Angel Slices, Mr Kipling Fiendish Fancies, Mr Kipling Toffee Terror Whirls, Cadbury Pumpkin Patch Gateau, ASDA Creepy Paper Cases, Orrible Orange Frosting, Slimy Lime Green Frosting, Ghoulish Ghost Microwave Cake Kit, Bats & Pumpkins Sprinkles, and more.